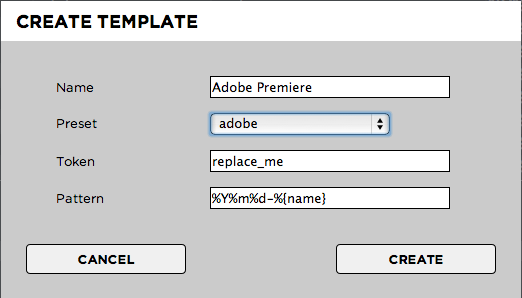 Pattern: The pattern for Avid templates cannot be modified. Avid templates always use “%name” which translates into e.g. “Projectname”. 8. Open the newly created Media Composer project and delete the bin that Avid has created. 10. In order to ensure that Media Composer will recognize network volumes as media drives open “Tools > Console” and type in “alldrives” into the console. If you see the message “All drives will be viewed as media drives. (Was previously set to having only true media drives act as media drives. )” you are good to go. If you see the message “Only true media drives will be viewed as media drives. (Was previously set to having all drives act as media drives. )”, type “alldrives” again. There are just two possible options. 12. Go to the location where you local Avid projects are saved. The default location is “Documents/Avid Projects”. 13. Enter the “replace_me” folder and copy the files “replace_me.avp”, “replace_me Settings.xml” and “replace_me Settings.avs” to your clipboard. 15. Paste the three files from the clipboard inside “strawberry-root/templates/your-template/projects/”. Do not put the files in a subfolder!